I saw a lot of yellow today. 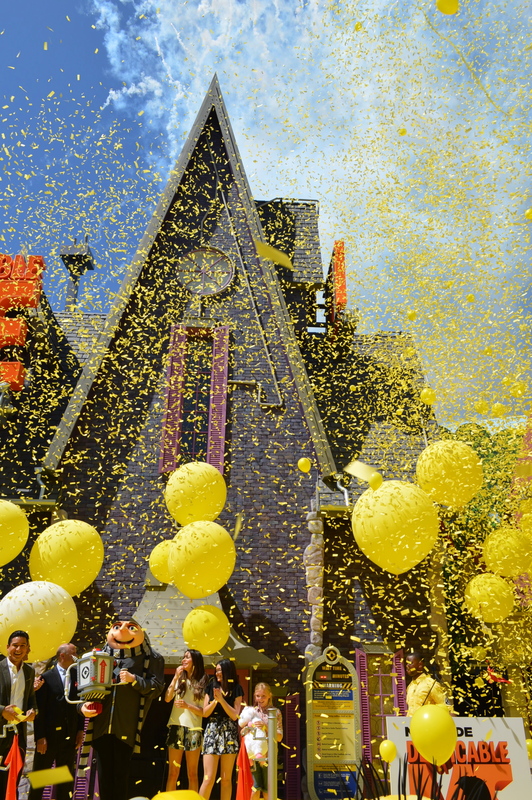 I was given a yellow hard-hat with minion eyes, talked to celebrities walking down a yellow carpet and had yellow balloons and streamers fall on me as a ribbon was cut to officially open the new 3D Ultra-HD adventure ride. 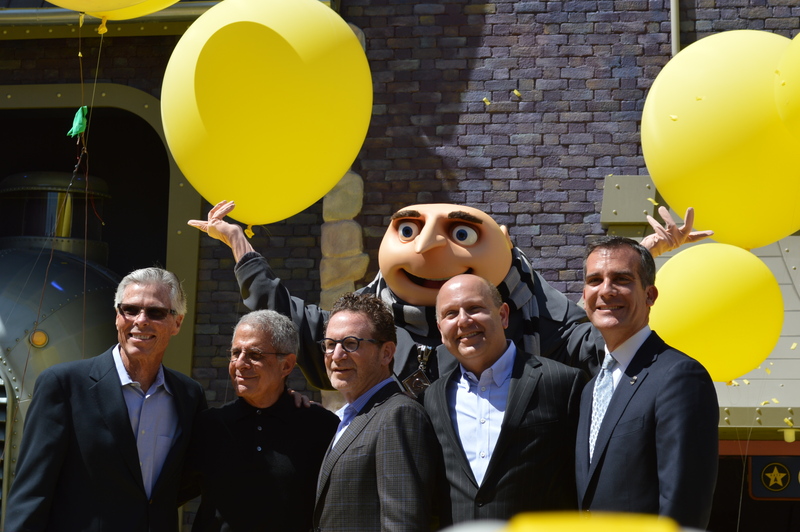 Despicable Me Minion Mayhem officially opens to the public at Universal Studios Hollywood tomorrow on Saturday, April 12, 2014. 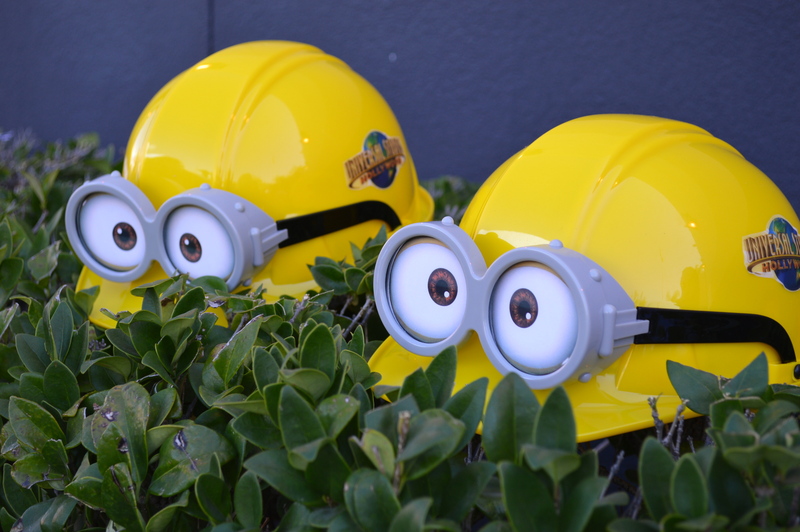 Guests are “turned into” iconic minions and embark in a secret training mission. “You feel as if you are in the Despicable Me movie,” said a ten-year old girl sitting next to me on the maiden voyage. It’s similar to the popular Universal Studios – The Simpson Ride, yet even better. Next to the ride is “Super Silly Fun Land” an immersive carnival setting based on that Universal Studios and Illumination Entertainment’s worldwide blockbuster, Despicable Me franchise. At the star-studded morning grand opening, the founder (2007), producer and CEO of Illumination Entertainment, Chris Meledandri walked down the yellow carpet talking to media. Behind him was Jon Corfino, the show producer, project director of the Despicable Me ride. Jon worked at Universal Studios when I was a tour guide at the park. We are both UCLA graduates, so I instantly had an affinity towards him. Rather than creating a roller coaster, guests sit in a row of four seats, put on their 3-D glasses and are blasted into Gru’s lab. The three girls from the movie Miranda Cosgrove (Margo), Dana Galer (Edith) and Elsie Fisher (Agnes) came down the carpet. Elsie Fisher was five-years-old when she was cast as Agnes. Her favorite actor is Steve Carrell who is the voice of Gru. “Despicable Me 2,” in which Gru gave up his evil schemes to become a devoted dad to the three girls has earned $970 million at the worldwide box office. Come be one of the first to experience the Despicable Me Minion Mayhem and the Super Silly Fun Land at Universal Studios Hollywood.